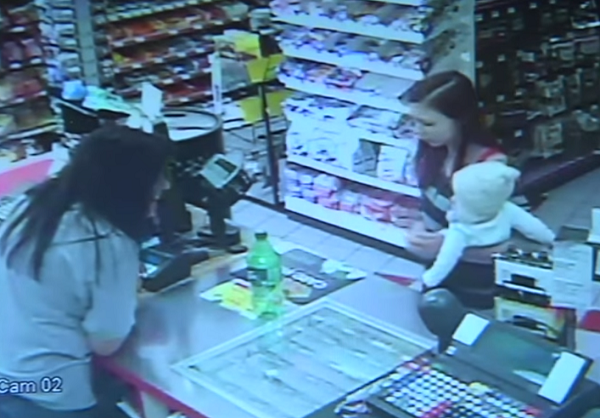 Store Clerk Saves Baby After Mom Suffers Seizure In Convenience Store. How closely do you pay attention to the people around you? Would you notice if someone was suddenly on the verge of a seizure? 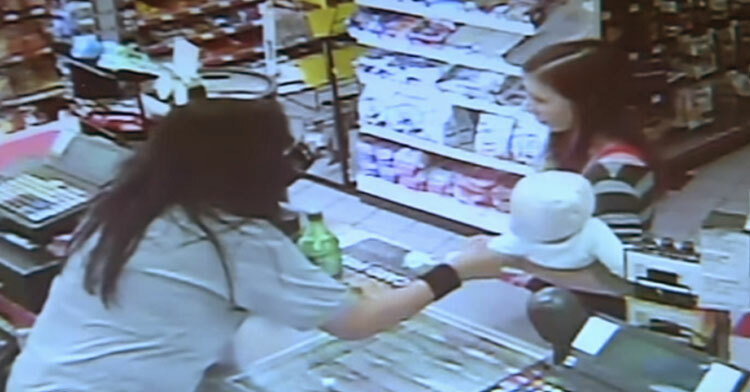 Rebecca Montano was at work as a store clerk at Alta Convenience Store in Arvada, Colorado when this very scenario played out right before her eyes. Rebecca had been working behind the counter when a young mother approached the counter, carrying her infant daughter. 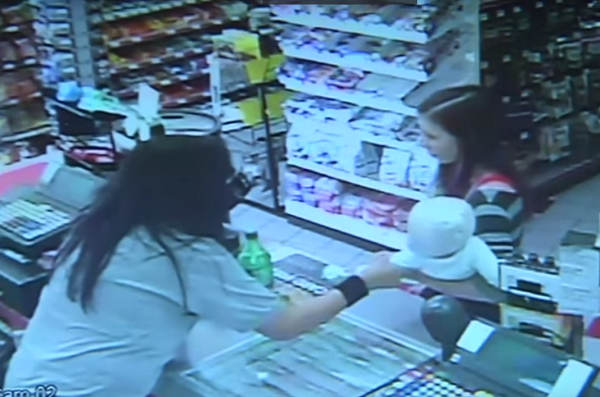 Rebecca began to chat with the young woman, who was purchasing a bottle of soda. She started making the usual funny faces at the baby, trying to get her to react. I’m a mom, I’m a grandma, so I love babies. So I wanted to try and get the baby to talk to me or smile or anything. Yet as she stood across the counter from the woman and her baby, something seemed a little bit off. The young woman began to stare off into the distance, her eyes glazed over. Ever so slightly, she started to sway unsteadily on her feet. 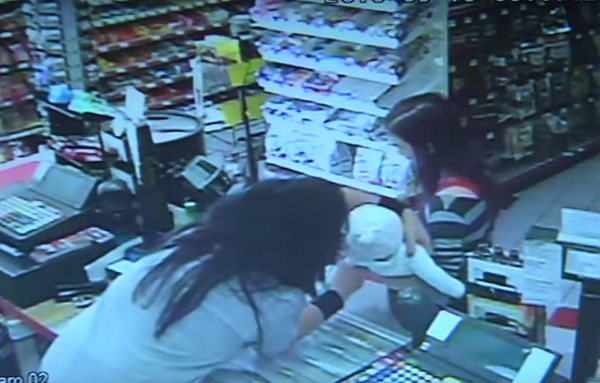 Even in the store’s silent surveillance camera footage, you can see that Rebecca is instantly alarmed by the woman’s sudden change. Rebecca leans in and asks, “Are you alright? What’s happening? Do you need to sit down?” but the woman has no reaction whatsoever. Finally, Rebecca senses that the woman is so unsteady, she fears for the child’s safety. She reaches across the counter and grasps the child’s arm, holding on as the young mother sways even more on her feet. When she gets no response, Rebecca lifts the child entirely out of the mother’s arms, holding her safely behind the counter. Seconds later, the mother slumps against the counter and begins to seize. Incredibly, Rebecca attempts to hold the woman up with one hand while still holding the infant, but she can’t keep her grip. Other customers rush to the counter to help out, and as they hold the baby, Rebecca calls 911 and sits with her as she endures a powerful seizure. 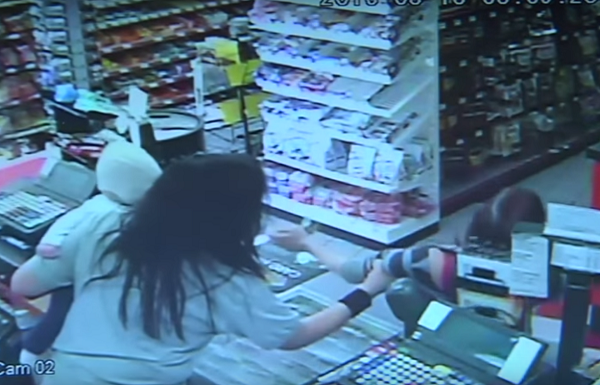 Paramedics arrived and took the mother and child to the hospital, and a few days later the young woman came back to the store to thank Rebecca for saving her baby from what could have been a brutal fall. She came into the store last Wednesday to tell me thank you for saving her baby, that she’s had seizures all her life, and if I hadn’t been there, she didn’t know what would have happened to her baby. Everyone who sees the dramatic footage of Rebecca stepping in to help calls her a hero, yet she maintains that she’s just a regular person who helps others whenever she can. Her quick-thinking and willingness to help someone in need are indeed heroic; they’re also a great reminder for all of us to pay attention to those around us at all times. You just never know when you’ll be called upon to save someone’s life! Watch the video below, and don’t forget to share.